Nose: a very warm, waxy start. Old polished floors, beeswax, a little paraffin and then these luscious jammy fruits, always with a tropical edge. Tangerine, mango, guava, apricot. Whiffs of muscat grapes and honeysuckle. Some meadow flowers and vanilla cake with icing. Citrus peel too. Exemplary. Mouth: starts on creamy fruits and vanilla (pears, pineapples, banana cake), mixed with lemony oak polish and drops of old herbal liqueurs. Leathery notes, butter biscuits, some oak spices (ginger). Orange peel. Hints of grapefruits and mint towards the end. Finish: long, still complex, with fruits, spices and the typical waxiness. Again a wonderfully elegant combination of fruity tartness, spicy oak, floral and waxy notes. Highly recommended. TWE changed their description on this, originally it was described as a single malt from Glenfarclas without using the name and now it is a blended malt. 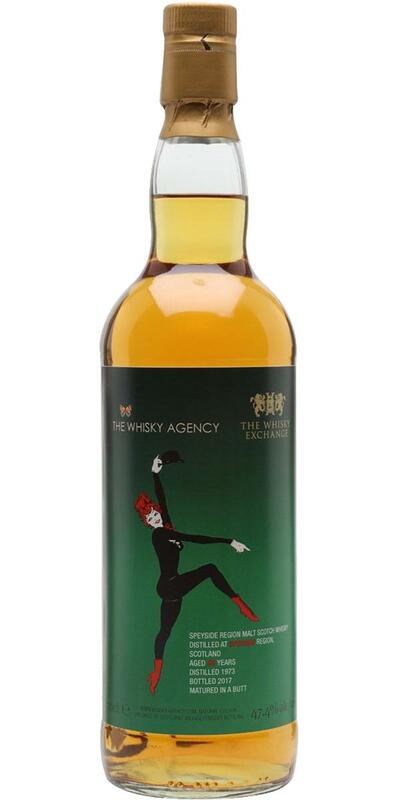 Interesting approach on their part as almost none of these undisclosed Speysides are labeled as single malts, it is incredibly excellent stuff, but poor business practice by TWE to make those who've already purchased think they're getting something different. Makes me wonder though are all these old Speysides actually blended/teaspooned malts and not single malts and that's why they can't be labeled as farclas or whatever distillery and have sat around so long just now selling very cheap for their age and quality. Makes you wonder. ""While we can't explicitly tell you which family-owned distillery this is from, it's one of our favourites, and they're well known for producing great whisky from sherry butts. We'll leave the guessing up to you...""
I've tasted fruitier examples of this style, yet this one has a lovely balance and a good complexity. I know it's not cheap, but at this price you'd be hard pressed to find something better from this era. Very waxy with hints of furniture polish, a touch of resin and whiffs of honey. There's plenty of orange marmalade too, as well as mango and apricot, and just a whiff of fresh apple parts. There's a bit of lime here too, as well as a very thin veneer of star anise and brown sugar. Starts of on hints of lemon peel, and polished oak as well. Rather creamy. A whiff of mushed banana, vanilla, tinned pineapple and candy floss. Fruity, but not super fruity, and it has a somewhat spicy side as well. Slightly tannic, waxy and hints of tropical fruits. Very long and pleasant. Sukhinder Singh confirmed today this is SINGLE Malt aged in fino cask from a well known family distillery, this was labeled as blended for legal reasons. Personally, I found the Liquid Treasures to be the best so far, so I have to rate this one under 93. However, I find this better than the "Art Nouveau Ladies WID 94857" for example, which I again both rated with 92 points. Can absolutely compete with the best of the undisclosed Speysiders, very round and yes, smooth - really, really yet another great unknown Speysider from 1973! Intense, tropical and exotic fruits galore, pineapple, mango, passion fruit, peaches, apples, hoey, fine oak wood - excellent! Little punchy, oily, creamy, mellow, fruity explosion, sticky honey, finest oak wood, absolutely no flaw - superb! Long, warm, very round, little more woody but really still very fruity and enough sweet - great! Love the nose... similar to a number of these undisclosed 1973's I have tried as well as some Glenfarclas from same era aged in plain oak. Tastes more herbal than I prefer, but this is preference and can't fault it. Just the slight sourness and slight bitterness on the finish loses some points. Old furniture, beeswax, and an entourage of ripe tropical fruits... especially guava, cherimoya, pineapple. Over time there are notes of menthol and spring flowers. Very different from the nose. Very herbal, and the primary fruits are ripe pears and apples. Sweet yet dry at the same time if that makes sense, followed by a little tingle from the oak. Long, various citrus (both sweet and sour), bitter walnut skin, and some menthol herbal concoction. We know these batches well, all bottlings we’ve tried so far have been pretty brilliant. Colour: gold. Nose: madre de dios! Old apples, honeycomb, beeswax, oranges, lime-flower tea, honeysuckle, a touch of camphor, jujubes, cigarette tobacco… This nose is simply astounding, magnificent, otherworldly, superlatively entrancing (that’ll do, s.)… Mouth: as I said. There’s some kind of mentholated oak as well, toffee apples, thyme honey, crystallised tangerines, earl grey, peaches, apricot stones, ripe mirabelles and the spirit made thereof, pine sap sweets… It’s all perfect, while the oak would never get in the way. After forty-three years! Finish: rather long and rather sappier, with even more pine, camphor, and eucalyptus. A wonderful cough medicine, this. Sumptuous earthy/pine-y aftertaste. Comments: maybe I’m amazed. Well, I am. If you like pine-y stuff as much as I do, you may consider trying to secure a bottle of this wonder! These are so good, it's getting boring! Despite the switcheroo description from TWE, this is very typical of a 1973 Fino cask Speyside, presumably from Glenfarclas. I do wonder what prompted TWE to say it's a blended malt, when the original description implied single malt. Did they receive knowledge that it was teaspooned? Tried this side by side with the 1973 Speyside from TWA bottled for their 10th year anniversary at 48.6%. That one seems to be just incrementally better -- slightly thicker, creamier, and perhaps a bit more balanced with less oak (not that this is oaky by any means), but with less tanginess and less bite. Very typical of the 1973 undisclosed Speysides. Sweet, tangy, sourish components are at the forefront. Raspberry frosting. Passionfruit. Also sweet hard candy. A good 1973, rather viscous, with an oily component, intermixed with the fruits, of course. The tangy sourish notes are still here. Again, this is very typical of the 1973's, but the notes are somewhat brighter. Not too oaky. Quite balance, and good length. 91.5 points.